I never know what the hell to do with cabbage. The options always seem to be cole slaw (which I don’t ever want or feel like an entire cabbage worth of), sour kraut (see cole slaw), or some sort of cabbage salad, usually involving ramen noodles (which I like, but only sometimes). Today I found myself with a cute little organic cabbage in my refrigerator, but not much else. I also had some baked tofu and some carrots, and after looking in the fridge a million times, I had an idea for a soup. Somewhere in my brain lived this soup – a light tomato base, with sweet and sour and spicy flavorings. I can’t think of where I might have tasted something like this in the past, but there it was. Who was I to argue? It used the damn cabbage, didn’t it? I’m really pleased with the results. It’s a really comforting, warming winter soup. If you have extra ingredients on hand like bell peppers, mushrooms, or zucchini, feel free to add them in. I gave it a billion grinds of black pepper to finish it, and it really brought everything together. Seasoned rice vinegar is the sour flavor here, but if you only have regular rice vinegar, you can make a substitution as follows: One cup of seasoned rice vinegar is the same as 3/4 cup white rice vinegar plus 1/4 cup sugar plus 2 teaspoons salt. That’s what the internet told me, I haven’t tried it myself! Heat a large 5 qt soup pot that has a heavy lid over medium heat. Add oil and onion, and saute until golden. Meanwhile, quarter your cabbage, remove the core, and shred the cabbage with a large chef’s knife. Add carrots, tomatoes, cabbage and water to the pot and stir well. Add the tofu, tamari, vinegar, chili flakes and salt. Bring to a boil, cover, then turn heat down to medium low. Simmer for 20 minutes or until cabbage and carrots are the desired tenderness. i got excited as soon as i saw this soup on flickr! exactly what i need for my cold. In what way is seasoned rice vinegar seasoned? This reminds me of a soup I get at this vegan place in Worcester called Quan Yin. The hot and sour soup has a thin broth, and I like it a lot better than the usual mucuos-y kind they have at most Chinese restaurants. Also, you are so creative! If I saw cabbage and not much else in my fridge, I would probably give up hope and go hungry for the rest of the day. This looks so incredibly good, I saved the recipe for the future! 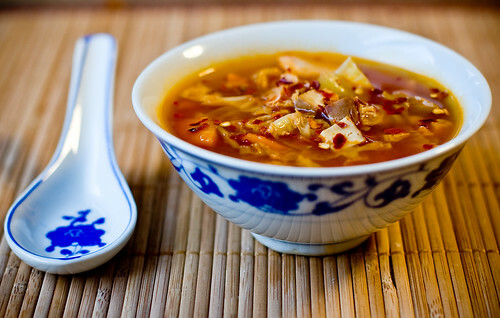 Funny– last night I was looking for a recipe for hot and sour soup with cabbage. I think I’ve found what I was looking for! I’m the same with cabbage. I’ll buy one, spend ages finally using it up and then not buy another for a long time. I will keep this in mind for when I have the last of a pesky cabbage to use up. I bought an entire head of cabagge for “egg” rolls only to find out the wrappers really had egg in them! I have a use for that silly cabbage now! Thank you. I had some leftover cabbage from my last CSA share. It had seen better days and this sounded like a good dish to use it up with. Here’s the catch… I’ve always been a bit ambivalent towards hot and sour soup. (Isn’t that ironic?) Anyway, I made it and it is great. Perhaps I like it because now I am actually 100% sure what I am tasting. I think in the past I’ve never been sure what the flavors were. Here’s a tip for the Boston folks. The Super 88 near Grasshopper carries these Soya Co tofu chunks that are flavored. The hot and spicy package was great for this soup. FYI – Soya Co which makes them is they same people that make Tofettes that cost a lot more at the supermarket. I emailed Soya co to confirm vegan-ness as the ingredients list is a bit sketchy with descriptive things like “sauce”. They confirmed that all Soya Co products are animal free, including chicken flavor! The bowl and spoon give the soup an authentic look! I love love love hot and sour soup, and this looks like an exact veganized replica. I’m in Australia so for the tofu I used Mr Lee’s seasoned pressed tofu – was perfect. It was so long since I’d bought cabbage I had no idea it cost $3 for a half head now. Hot and Sour!!! I love that one. I am sooo trying I used to love it while I was in China… but now that I dont eat so much meat anymore (or rather none), I just was looking for something like this! We used veg. stock for 4 cup of water, savory cabage and mirin (with a bit of salt) in place of the seasoned rice vinegar. I didn’t think the red-pepper flakes would be hot enough, and had planned to add some sriracha, but didn’t need it. Also, canned-sliced, roughly chopped water chestnuts worked very well with it, too. The black pepper really does bring it together. I really agree with the last commentor, except that I am striving to eat less cruely and more healthy so you have inspired me in so many ways. I am so looking forward to your book and Veganomicon as well as purchasing many more. So far I have been struggling with trying a new lifestyle and still cooking for my carnivore family, but still I know you make delcious recipes that my entire family can eat. Thank you. i was just thinking….hmmm…what am i going to do with my head of cabbage? thanks!!!!!!!!! OK…I DID make this soup and I have to tell you ….it WAS AWESOME. Michael and I LOVED it….and will make it often. Thanks for having the cabbage in your refrig! I was looking for cabbage recipes because we bought this HUGE head of cabbage at the farmer’s market. So I made this last night and it was delicious! Thanks for the recipe! Boyfriend even said it was probably the best cabbage soup he’d ever had! I just made this, and it’s amazing! On first taste, though, it didn’t seem so hot, so I added some more chili flakes… And now I’m taking a break from eating because my mouth’s so on fire. But it’s absolutely delicious! This soup looks amazing. I’m just reading back through your blog after stumbling on it for the first time today. However, I made cabbage rolls with shredded cabbage along with some other random stuff I threw in the pan. I don’t know how you feel about the ground “beef” that Boca or Morningstar Farms make, but it used that, some carmelized onions (though I love your super-carmelized onion idea…I could eat just carmelized onions, and frequently poach some from the pan while cooking), sauerkraut, caraway…sauteed in white wine and stuffed in white bread rolls. Some other herbs, too. It was nothing gourmet, but both my omni husband and my vegetarian toddler son were quite pleased with them. Just another way to use up some cabbage. My husband used some of the extra filling in a grilled-cheese manner with extra sauerkraut. I was looking at the head of cabbage in my fridge that desperately needs to be used because I’ve put off cooking to get over the flu, and I remembered this recipe. It sounds so perfect and mostly uses stuff I already have! I’m really excited to make it. My fave Chinese Restaraunt went out of business :( and I mourn for their hot & sour soup. I can’t wait to try your version! This recipe is super amazing! It tastes so good that you forget how easy it is to make! I found myself low on rice vinegar and used apple cidar vinegar to fill in and the taste was just brilliant. My son loves it, too! what a great/unique take on hot and sour soup! i skipped the oil to lower the fat and calories and also the tofu and carrots, because i didnt have any available. but i added some straw mushrooms which were wonderful. instead of water i used chicken broth. i loved the tomatoes. i used the “noted” rice vinegar, made with sugar substitute and the salt. thank you for posting this wonderful recipe. This recipe inspired me to buy a cabbage–probably for the first time in years. I appreciate you sharing your creativity. I absolutely loved the end result of the recipe. Delicious! I’ve just tried this recipe and it turned out just incredible!! Thank you for your amazing blog! I bought several small organic cabbages for homemade kraut from “I Eat Food’s” blog ( http://ieatfood.net/?p=119 ), had one left over, and yearned for soup. I have a decent (paper) library of vegan cookbooks but none had a cabbage soup recipe. I just typed vegan+cabbage+soup into a search engine and your recipe magically appeared. The internet blows my mind almost every day. No way could Grandma have ever found this recipe. And it’s astonishingly good! I feared it would be too sour or too hot or too sweet, but it’s p e r f e c t i o n . Subtle. Delish. Inspired. Thank you! I just made this today…it was delicious! Just the right amount of spiciness and much less oily and mushy than chinese restaurant hot & sour soup. I left the cabbage slightly crisp, giving texture to my soup. THANKS SO MUCH! Your site and pics are inspirational. Your pre-recipe recitation actually caused me to make an audible snortle laugh. I got my bi-weekly box Tuesday and there was another cabbage. I like cabbage but I had just finished the one from the previous box(chow mien, oh no wait, it was fried rice this time!). So I Googled “hot and sour soup” because last time I made a great batch I never wrote down how I did it. I clicked on yours because it was Vegan and then I got to read your humorous and oh so “me” prologue. BTW the recipe looks perfect and I’m going to make it today. Thank You! This recipe is a keeper. Made it this weekend. Tasted great hot off the stove, but also tastes really good cold. I keep going to the fridge for big spoonfuls. I added chopped celery and minced garlic to mine. Also, I forgot to get the marinated tofu that I wanted to use, so I used the seitan that I had on hand, and chopped it up into little pieces. Not bad, but I’m sure the tofu would have been perfect. I like the very low amount of oil used. The lack of lots of oil makes the soup taste light and healthy. What a delicious, easy-to-make soup! I baked my own tofu while the onions were frying and I was preparing and assembling the other ingredients. And the soup was even better the next day– so comforting and warming! Mac and Cheese. Cheeze? Yeast?